Book, Booker, Bookest: Happy Birthday to My First Picture Book, ANIMAL HOUSE!!!! Happy Birthday to My First Picture Book, ANIMAL HOUSE!!!! Please join the Animal House wordplay antics going on right now at illustrator Nathan Hale's blog. Visit the "My Books" page on my website to get your very own copy and to read reviews of the book. I'd especially love and appreciate your efforts to support independent bookstores when you support me. Thanks!! Plus, you can have a chance at winning an autographed copy of Animal House on Goodreads by clicking here. The giveaway will run through the month of August. Good luck!! CONGRATULATIONS CANDACE!!!! So proud of you and all your hard work and patience for delivering this "baby" is finally here! Can't wait to get a copy for the kids, they'll be so excited! Thanks so much, Risa!!!! I appreciate the shout-out and can't wait to get you guys a copy! 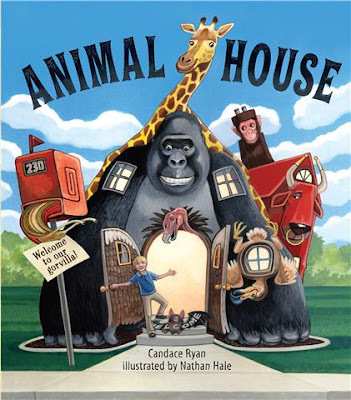 Heard about Animal House on the SCBWI listserve and think it is just beautiful. Congrats to you! This is one of those kids books that's going to become a classic that they will remember forever. Hilde Garcia just put up a post talking about how important these books are to kids on our blog.